A bridal couple embraces amid the garland-draped pillars of this bright white, horizontal z-fold invitation. Embossing and touches of pearl add to the romance. Inside, a verse of your choice is printed in the center and your wording is on the right. Your names may be printed on the front. This card is very beautiful and elegant. I got mine last minute and received it 4 days after the order (with expedited shipping). I totally love it, the picture doesn't do justice to the card in person. I was not too sure about this card at first, so I got a sample one and WE LOVE IT. 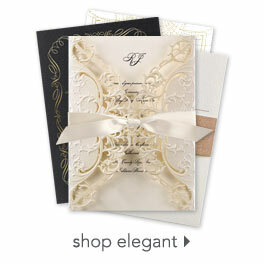 Everyone who received this invitation love it and thought it was so elegant. For the price this was a steal and if you don't want or have the budget to spend a lot of money on a fancy invitation this one will look like you spent $$$. Great Job IBD! I am always a little nervous about ordering from the internet. However, no worries here. The ordering process was fast and delivery was within a week ( not to sacrifice quality, however). My daughter and I were extremely pleased with the wedding invitations. I thought it would look different than what it does on the computer but when I receive my order I realized its exactly what I expected and saw on the website which is great because some websites you find something that you love and when you order it, you realize it's totally different than that you saw.